Have you ever stopped to take a hard look at your credit card? Aside from the cool design, shape, and colors, there are lots of numbers emblazoned on the front (unless it’s the Chase Sapphire Preferred). And those numbers are pretty darn important, as they are necessary to process your transactions to ensure everyone gets paid and credited properly. Years ago, the International Organization for Standardization (ISO) came up with worldwide standards for credit cards, which is why they all look similar and feel the same. This group was also responsible for publishing the identification numbers of major industries. Typically, credit cards come with 15 or 16 numerical digits, though some are as short as 12 and as long as 19 in some parts of the world. American Express credit cards are comprised of 15 digits, MasterCard and Discover credit cards are 16 digits in length, and Visa cards are either 13 or 16 digits. The first digit on a credit card is known as the Major Industry Identifier (MII), which identifies the category of the issuer of the card. As you can see, all major credit cards fall under banking and financial categories, though American Express cards have the special distinction of being travel and entertainment oriented, while Discover is merchandising oriented. Because of these unique identifiers, merchants can easily determine what major credit card company issued your card, which comes into play for interchange fees. Notice how a business will sometimes already know you’re using an American Express card or a Visa/MasterCard. It’s not magic, just a well-known fact. The first digit is followed by five more digits, which identify both the issuer of the credit card and the card type (IIN). So all Capital One Cash Credit Cards or all American Express Centurion Cards will start with the same six digits. You can look up the IIN for a particular credit card here to see if it’s correct. This list seems to be a bit hit or miss. The numbers that follow the IIN include a unique account number for the cardholder, followed by a checksum, which is a complicated algorithm that ensures the numbers all add up properly in the event of an error. So that’s basically it. Of course, there is also the expiration date on the card, which is an added security feature. And a CVV number on the front or back of the card, which is also intended to prevent fraud and boost security, especially for “card not present” transactions. You’re also supposed to sign the thing, though I never do. 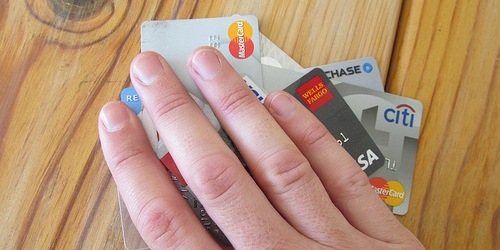 Hopefully you now have a better idea of how and why your credit card numbers are what they are. If nothing else, it’s interesting. Interesting stuff. Now I know which numbers are the most important to conceal. Interesting. I just assumed it was a random sequence of numbers other than the first digit signifying Visa/MC/Discover/Amex. That’s how those forms know what type of card you’re using the moment you enter the first digit. Interesting. I noticed that my authorized user cards are practically the same number as my primary card. Previous Previous post: The Average Age of Open Credit Lines Is Extremely Important!